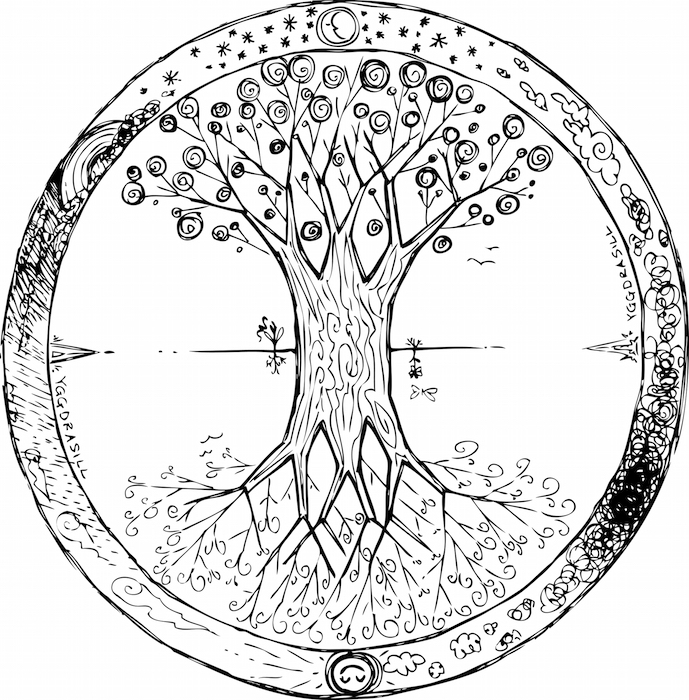 The symbolism represented by a tree mandala may seem simple and obvious. The tree is strong and sturdy, giving shade, shelter and life-sustaining sustenance. It actually holds much deeper meaning, though. Each type of tree has its own particular meaning and, when the tree mandala contains other images, the symbolism can become multi-faceted or more focused and specific. Trees represent longevity, good fortune, security, blessings from nature, shelter and family stability. Tree mandala designs encompass all of this wonderful symbolism within the circle of the mandala. Additional meanings are connected to various types of trees. For example, fruit trees symbolize a nurturing energy because the tree produces an edible fruit to nurture people and animals. There is even more specific symbolism based on the tree species. Apple trees are symbols of health and happiness, youth, beauty and magic. Avocado trees symbolize nourishment in the spiritual sense. Banana trees are about plentiful sustenance and danger, fertility and prosperity. Cherry trees represent new awakening and rebirth, new love, affection, romance and good fortune. Lemon trees symbolize the cleansing of impurities, the resulting freshness and healing. Lime trees represent lovers’ attraction and the mystery of intimacy. Many other types of trees carry additional significant meanings. Blue spruce trees are symbols of good intentions, generosity and the joy of giving. They, of course, are the tree of Christmas, yule and winter solstice. Chestnut trees symbolize long life and a healthy receptiveness to ancient wisdom. Japanese maples represent bountiful blessing and restful retreat. A Japanese maple mandala would be ideal for someone about to retire. Magnolia trees produce beautiful flowers. They symbolize matters of the heart, especially something held dear and ever-lasting love. The tree of life represents earth, fire, air and water — the four elements of life that must come together to create and sustain it. The roots of this tree grow deep within the earth to provide a strong foundation and receive water while the branches and leaves reach up to receive the sun and air to produce its nourishing fruit of life. This tree symbolizes the magic and mystery of life since the beginning of time. It is known by a variety of names, depending on the religion or culture, but what it symbolizes is fairly consistent. The tree of life represent healing and renewal in the physical, emotional and spiritual sense. It also represents communication and the more “magical” types of communication or ways of gaining knowledge like telepathy and osmosis. Tree mandalas make beautiful, meaningful art, décor pieces, jewelry and jewelry that looks like art. Tree mandala images are used in macramé or beaded macramé wall art and pendants, paintings and prints. These images vary widely. 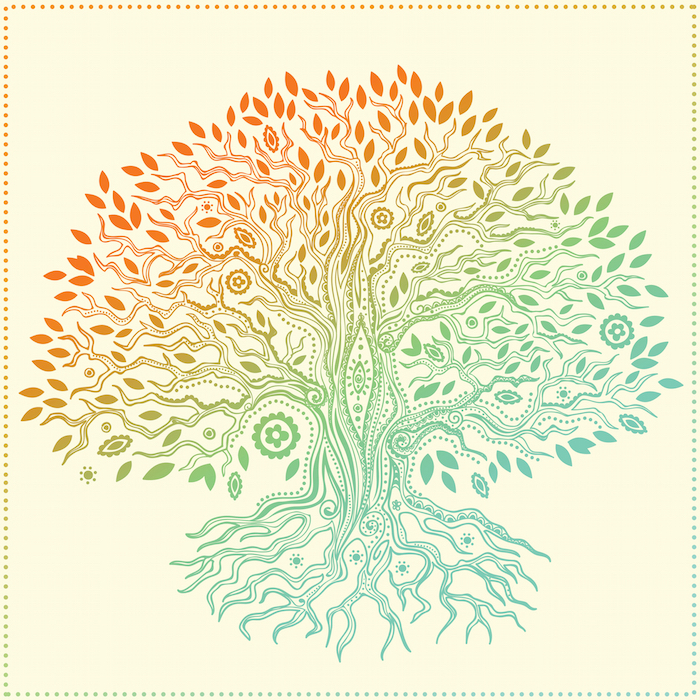 A tree may be included in a more traditional mandala design or it may be the main focus. Tree of life mandala art might include the four elements of earth, fire, water and air. If the goal is using the tree mandala for meditation, in keeping with traditional mandala purposes, select a tree mandala design that will help you focus and guide your meditation. A particular fruit tree, flowering tree, evergreen or deciduous tree will focus your meditation in the direction of a more specific goal. Tree mandala jewelry can be made with particular colors or materials that will help clear and balance your chakras. White and violet can be used for the crown chakra, indigo or purple for the Third Eye Chakra, blue for the throat chakra and green, pink or turquoise for the heart chakra. Natural stones and crystals should be used in jewelry designs intended for chakra work. Tree mandalas are excellent for coloring, which is a very therapeutic activity. They can be any color or design. Floral tree mandala images give you the opportunity to use a wider array of colors with the trunk, leaves and flowers. If you prefer fruit or foliage tree patterns, add some lotus flowers around the edge of the mandala design. The lotus flowers bring a floral element along with additional symbolism. The lotus represents easy transition. In Buddhism, the lotus flower symbolizes the sun and renunciation. Tree mandala coloring pages can be found on-line; however, they are the easiest mandala patterns to draw yourself. Let your imagination be your guide. Use something round like a compass, drinking glass or dinner plate to make mandala circles on your coloring pages then draw any tree you like within the circle. Tattoos that depict trees within mandala images are a great way to get more permanent symbolism that will be with you always. They can be colorful or not and complicated or simple. Additional images can be added to the pattern like the lotus flower, four elements or even animal symbols. All types of mandala tattoos work best on a larger, flat part of the body. The circular mandala pattern is easier to appreciate when you can easily see the entire tattoo. When larger mandala tattoos are placed on a smaller area like the arm or leg, the edges must be wrapped around the side. This changes the overall impact of the mandala tattoo. Smaller tree mandalas can be put anywhere, though.